Home > Law Books > Statutes > Bankruptcy Code, Rules and Forms, 2019 ed. Bankruptcy Code, Rules and Forms, 2019 ed. You can quickly locate relevant statutory provisions with Bankruptcy Code, Rules and Forms. 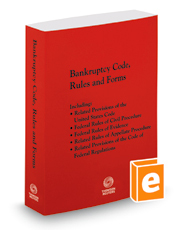 This volume contains a compilation of bankruptcy law and related provisions from the United States Code Annotated®, including bankruptcy code, rules and forms from Title 11, as well as related provisions from Titles 18 and 28.